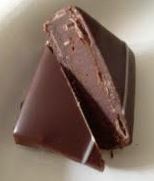 I’m a fan of La Maison du Chocolat and have been for many years. Their trustworthy flavours made with Valrhona chocolate blended especially for them means I can trust that everything has been carefully prepared from the trees and beans through to the finished product. 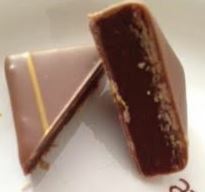 La Maison du Chocolat is a delicious, trustworthy brand of quality chocolate. Their summer collection is something I often look forward to. The flavours are fresh and new and limited edition. 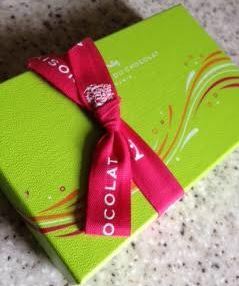 The packaging is always slightly different but while retaining that distinctive classic Maison du Chocolat style. 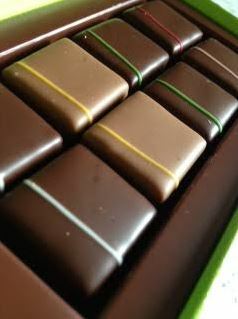 Everything about the chocolates from the carefully created ribbon through to the design of the interior of the box is stylish. It is an absolute joy to experience every element of La Maison du Chocolat. Five chocolate creations featuring cocktail flavours, a toast to the encounter of the savoir-faire of two of France’s Best Craftsmen: Nicolas Cloiseau, Master Chef of La Maison du Chocolat, and Maxime Hoerth, Head Barman of the famous Le Bristol Hotel in Paris. Faubourg – This ganache enrobed in milk chocolate unveils a heart of passion fruit with vanilla notes, enhanced by the soft tones of mango juice, mellowed by lemon tree honey. This has the flavour of the mango and passion fruit without the acidity, the honey and vanilla combining together to mellow everything. 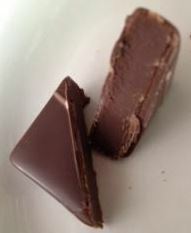 A gorgeously flavourful chocolate without booziness. MOF² – A lovely balance of taste for this ganache without cream, with the furtive notes of sweet orange yielding to the silkiness of the pineapple accented with coconut. I don’t like coconut so this wasn’t my favourite. It is subtle but still distinct. If you like coconut, this iteration with softened , subtle flavours and a small amount of actual coconut is going to be your favourite. 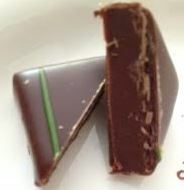 Peacock – This chocolate associates a purée of fresh raspberries from Ardèche with a ganache infused with verbena accented with vegetal notes and spicy Thai basil. This is an interesting take on the traditional raspberry and t is magnificent. I am haunted by the Thai basil which is hinted at in the ganache. This is brilliant and balanced. Bellini – This illustrious cocktail with its Italian charm parallels the creaminess of its chocolate version. This ganache holds all the crispness and acidity of light effervescent champagne revealing silky vineyard peach subtly bolstered by peach liqueur. Sweet but haunting, the peach is distinct without getting too much grape from the champagne. Interesting but probably not my favourite in this box though it is beautiful. 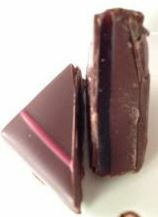 So Bristol – Inspired by the Signature cocktail of Le Bar du Bristol, this ganache associates the freshness of iced tea with bergamot with the delicate acidity of lime, flaunting the floral and sweet and sour notes of elderberry and finishing with the lovely edge of pink grapefruit. It combines so completely it is difficult to pick it apart. The grapefruit is probably most distinct but the iced tea with bergamot is there in the background supporting the elderberry. I want this cocktail in my life, let alone the chocolate! A whole box please!! Overall there are a wide variety of flavours going on, some extremely complex and impossible to pick apart, some less so but still delicious. I could eat a massive box of these and not get bored (someone else can have the coconut ones 😉 ). Grab a box NOW before they go as they are LIMITED EDITION.